The EPO launched the new version of its patent database Espacenet, currently only as a public test and in parallel to the existing old website. For the past two years, the EPO has been working on a new take on its popular patent search software Espacenet. 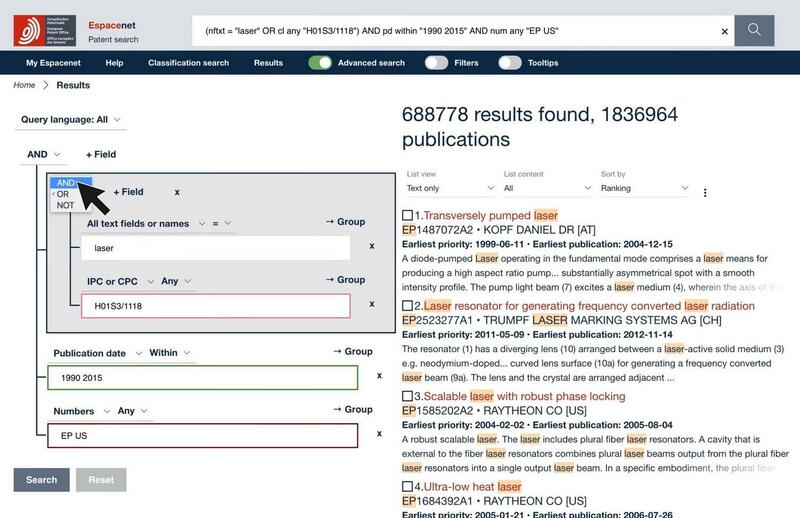 While the current website is already one of the best freely available tools to search for publicly available patent data, several factors have led the EPO to the decision to completely start from scratch with a new search interface: the new Espacenet is easier to use in general, and more accessible when using a mobile device such as a tablet or cellphone. Some workflows have been improved, e.g. you are now using a filter function instead of having to enter all parameters in the initial search. Screenshot of the new Espacenet. Personally, I think the new layout with search results on the left and opened documents on the right is the de-facto standard nowadays for any patent search software used by patent offices, attorneys, or other patent experts, so it is a very good decision to follow this approach.